Posted by admin | Category: Uncategorized | Comments Off on Friendship Dinner and Dance! This year’s Friendship Dinner and Dance will be on December 19th, 2014 at the newbly built Fremont facility Royal Palace Banquet Hall and Event Center. Please visit our facebook page for more details! I welcome you with great pleasure to our annual fundraiser, the Friendship Dinner and Dance, which benefits Matters of Community. I see some new faces in the crowd, so I would like to take a moment to help you learn about Matters of Community. MOC was established in 2004, when I was a sophomore in high school, with the goal of helping mainstream special needs children through music, arts, theater, and sports. We have worked with many organizations over the years both in the states and abroad to help reach our goals. In this past year, we have continued to expand our work with several organizations while also creating new programs and opportunities that I am excited to share tonight. Some of you may recall our ongoing efforts with the Delhi Blind Relief Association to support their music program. Last year we embarked on a journey to further our collaboration by helping to modernize their library with the latest software, technology, and electronic embossers to enable audio books for the blind, a first in India. As an organization, we are really appreciative of the help we received from the California School for the Blind in Fremont. I would like to personally thank Mr Jerry Kuns who is here with us today. Our project would not have been possible without the personal support of Mr. Jerry Kuns, the IT professional and head of the computer systems lab at the California School for the Blind in Fremont. Mr Jerry Kuns spoke about the proposed solution and how it will benefit children in India. Mr. Rajeev Rai spoke about QA Source’s involvement in the project. Deputy Consul General of India, Mr Jha spoke about the importance of working together to help children with special needs. I briefly talked about an alliance we were planning with the College Internship Program during our fundraiser last year. CIP is a global organization that prepares young adults with learning differences for independent living. I was impressed with the way CIP challenges these teenagers and young adults to use their natural talents for art, videography, music and sports to compete for excellence. I am proud to announce that Matters of Community now sponsors a scholarship award for such art competitions across the nation. The program is conducted independently by CIP, and MOC will be offering the scholarship to the awarded student. Sarah Williams of CIP described the program and highlight how MOC’s participation with the scholarship enhances these programs. A representative for US Congressman Eric Swallwell, Gabriel Orteaga presented the scholarship check on MOC’s behalf and presented Neal with a certificate of Congressional Recognition. Earlier in the evening, Navin described the wonderful after school program East Bay Jazz Society organizes for the kids in FUSD. MOC always supports this outstanding program. Fremont Council Member Dr Raj Salwan spoke about the importance of this effort and its impact on Fremont and presented a commendation to Jazzinators and Neal Bharadwaj from the City of Fremont. Matters of Community presented a check to the East Bay Jazz Society to continue the outstanding work they do. Another organization that I am proud to be associated with is Jeena. Jeena has been instrumental in setting out vision since MOC’s beginning. Jeena is a non-profit resource center in Milpitas for special needs kids and their parents. My family and I have always enjoyed supporting Jeena’s kids in every way possible. It is my honor to introduce to you someone who I have always looked up to, my mentor and Jeena’s founder, Rajni Madan. Rajni talked about Jeena’s experience with Neal and Navin, and how she has seen MOC grow. San Jose City Council Member Kansen Chu talked about the import work both organizations are doing and presented Jeena a commendation from the City of San Jose and a check on behalf of Matters of Community. You will be pleased to know that MOC undertook two key collaborations. 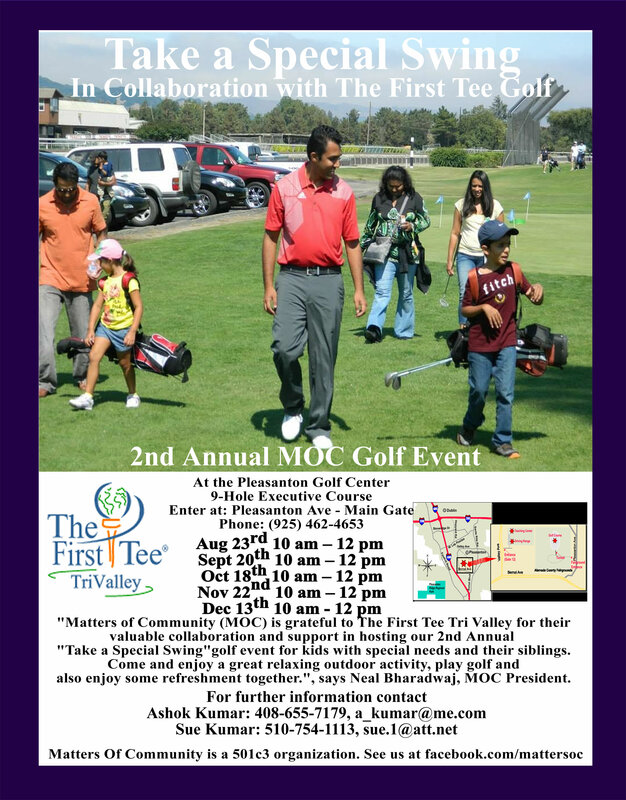 First, MOC worked closely with the Local First Tee Organization and the kids of Jeena to launch “Take a Special Swing” program. This summer-long golf program for special needs kids was a tremendous success with several Jeena Kids and their siblings participating in an amazing outdoor golf activity. MOC is especially thankful to the First Tee organization that provided all the resource including one-on-one coaches to work with each kid. The camp culminated in the kids actually playing their first ever regulation style hole at the Pleasanton Golf Center. Dan McKegney of the First Tee Tri-Valley organization talked about the summer program and how excited they are to continue this relationship. California Senate Majority Leader Ellen Corbett spoke about both organizations and presented a Certificate of Recognition on behalf of the California State Senate to Dan McKegney and Neal for their work with kids. 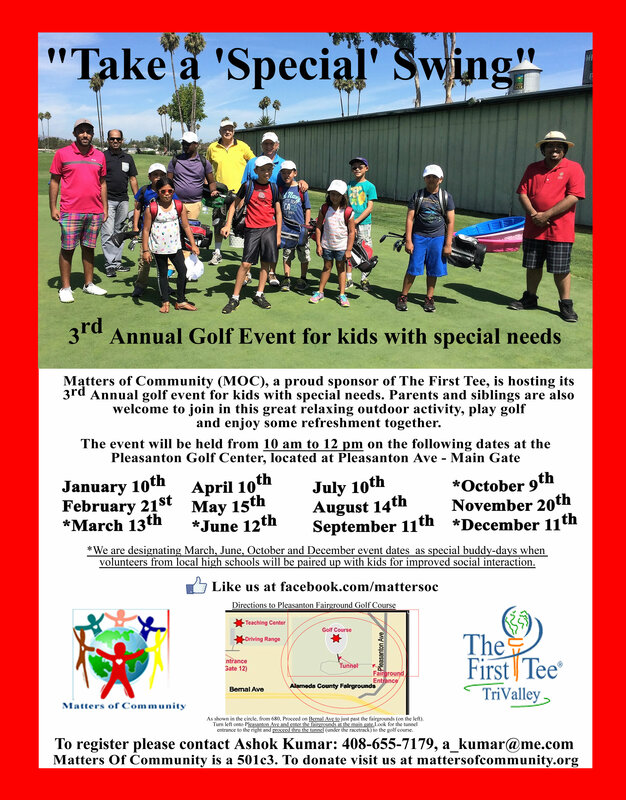 On behalf of Matters of Community, she presented a check to the First Tee Trivalley Organization. Some of our golfers were on hand and we presented them with a trophy and a little goody bag for their hard work! I then recognized the Board of Directors to the stage: Sonia Rai, Raj Goyal, Kulbir Handa, Malini Gawrish, Ashok Kumar, Sue Kumar, Seema Sharma who could not be here as she is on her honey moon, and our new understudy Pooja Goyal. I wanted to personally recognize a volunteer in our organization for his outstanding work this year. Since January he has been helping me by volunteering his time with Special Swing and with planning for the Friendship Dinner Dance. I awarded Karan Rai as the Volunteer of the Year. All pictures can be found by visiting our facebook fan page. Posted by admin | Category: Uncategorized | Comments Off on Summer Success! This summer we held golf classes for special needs kids by working with our friends at First Tee Tri-Valley and Jeena! We held personalized golf lessons for each kid, working hands on with them to teach them the skills useful on and off the golf course! Posted by admin | Category: Uncategorized | Comments Off on SitaarreTV Coverage from 2/24/13! Please enjoy this clip of today’s SitaarreTV episode which featured Matters of Community! Thank you to everyone who attended our Friendship Dinner Dance. The evening was a wild success, and was well attended. -Jake Brymner, a representative for newly elected US Congressman Eric Swallwell of California’s 15th District. We would also like to thank our wonderful performers and volunteers for their tireless work! More details and pictures to follow. Featured in the Argus NewsPaper! Posted by admin | Category: Uncategorized | Comments Off on Featured in the Argus NewsPaper! Matters of Community was featured on the Front Page of Tuesday’s Argus Newspaper. Please visit the link to read more.